Yesterday, a leak from one of the most reliable Apple rumour sleuths claimed that the iPhone 8 won’t feature a fingerprint scanner integrated into the display. That feature has been expected for some time. But if a new report is correct, it seems that fingerprints are going to be replaced with 3D facial recognition. Citing people familiar with the product who did not want to be named, Bloomberg reports that Apple is currently testing whole face 3D scanning with the goal of integrating it into the upcoming iPhone 8. A new 3D sensor is said to be the backbone of the technology and iris scanning may also be a feature. The sources say that designers are focused on increasing the speed of the sensor’s recognition capabilities and that it only takes “a few hundred milliseconds” to unlock the phone. It can reportedly recognise faces even if the phone is laying flat on a table. Because the 3D scanner uses more data points, it is said to be more secure than the fingerprint scanner. That would be a leap forward in phone-based facial recognition. Both the facial recognition and iris recognition software on the Samsung Galaxy S8 have notoriously been easy to fool with a photograph. But the Galaxy S8 is only a 2D scan. Considering the fact that Apple has gone 10 years with a remarkable security record on the iPhone, it’s probably safe to say that this won’t be released until it’s extremely tight. 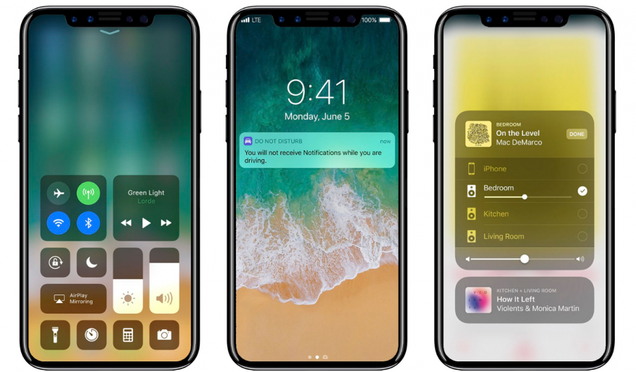 The report that claims the iPhone 8 won’t have a fingerprint scanner built into its OLED display came from KGI’s Ming-Chi Kuo, who has a strong track record of getting things right. Intriguingly, the report also claims that there will know touch ID whatsoever. Though Bloomberg is saying that the inclusion of 3D facial recognition is still dependent on testing, it seems like Apple should have made a decision by now. Your mileage may vary on how excited you are to be feeding your biometric data into another system, but the possibility that the 3D scanner could be integrated with Apple’s new augmented reality features sounds great. Earlier reports have also indicated that the phone will have a dedicated chip for AI capabilities will improve voice and facial recognition, as well as extend battery life.